With more than 28 years experience in dentistry, Dr. Dinning is able to provide for the diverse needs of all of his patients. Keeping both aesthetics and functionality in mind, Dr. Dinning can help patients achieve their ideal smile through the following procedures. EPIC™ is the only laser in the USA with three unique therapy modes – Soft Tissue Surgery, Whitening, and Pain Therapy including TMJ issues. No matter which therapy you are in need of, you have EPIC™ versatility available through Dr. Dinning at the touch of a finger using a fully advanced, fast, easy, and pain free experience. Whitening in just 20 minutes! Who knew! The Inman Aligner is the perfect solution for crowding or protrusion of the front teeth. It is really efficient, very safe and great value. With the patented Inman Aligner, your front teeth can be gently guided to an ideal position in a matter of weeks. Most cases complete in 6-18 weeks and because it's removable you can take it out to fit with your lifestyle. Dr. Dinning is certified with Inman making that one front annoying tooth, just perfect. There’s never been a better time to straighten your teeth with the most advanced clear aligner in the world. Dr. Dinning has been Invisalign certified for over 10 years, offering his patients up to 50% faster treatment times, proven results, better fit, better comfort, and effective for a wide variety of cases. This is also a unique feature for teens! Inquire more with the office today. Being the only dentist in the Santa Barbara area to offer this technology to his patients, Dr. Dinning is able to perform procedures without anesthesia (needles and drills) as it is one of the least invasive technologies out there. It lets us perform more procedures in a single visit, with minimally invasive procedures that mean more stress-free experience in the chair. 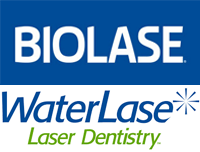 The versatile and gentle combination of laser energy and water has the power to relieve dental anxiety at the source—for you, and the patients we serve. One of the simplest ways to take years off of your appearance and improve your smile is to whiten your teeth. With professional in-office and take-home treatments available, our patients can achieve a smile that is up to eight shades brighter. In line with our commitment to providing the most up-to-date cosmetic dentistry procedures at our Santa Barbara practice, we offer the Zoom!® Teeth Whitening system. This advanced technology can produce noticeable results in less than one hour. Kor Whitening is a service Dr. Dinning offers to patients who are working with really hard stains in their enamel. This is used for deep bleaching and is highly effective. The result is a thorough cleansing of debris from between enamel rods, rejuvenating the enamel and delivering truly amazing whiteness. If you're pressed for time but still want the best that teeth whitening has to offer, ZOOM! whitening could be perfect for you. With ZOOM! whitening, bright, white teeth can be yours in about an hour. Using light activated whitening gel, ZOOM! whitening is fast, safe and more effective than take-home whitening kits. Whether you're a busy professional, have a special event coming up or just want a smile boost, ZOOM! whitening is great for just about everyone. Porcelain veneers are one of the most popular dental treatments available today. These thin, ceramic pieces are bonded to the front of the teeth to create a flawless finish. Patients who wish to conceal imperfections in the smile can receive veneers in two office visits. As an experienced cosmetic dentist, Dr. Dinning has a keen aesthetic eye, helping him provide patients with attractive, natural-looking results. Dental crowns serve both restorative and cosmetic purposes. A crown completely encases the tooth and protects it from further damage or decay, while simultaneously preserving the appearance of the smile. Crowns are an effective treatment for patients who suffer from severely damaged or decayed teeth. Dental implants are the most effective dental treatment available for patients who have missing or severely damaged teeth. Implants are titanium posts that are surgically placed in the jawbone to serve as a root for a restoration such as a dental crown or bridge. Implants are strong and durable, and provide incomparable comfort while talking and chewing. Dr. Dinning wants patients to know that effective dental treatment doesn’t have to detract from their smile. Composite fillings, also known as white fillings or tooth-colored fillings, are an appealing alternative to the traditional metal-based fillings that can attract unwanted attention to the teeth. Composite fillings seamlessly blend with the natural teeth while providing safer protection against tooth decay than their amalgam counterparts. In instances where patients suffer from minor cosmetic imperfections such as stains or cracks in the teeth, dental bonding is a fast and effective treatment option. Dr. Dinning places a tooth-colored resin on the teeth to cover up these flaws and improve the appearance of the smile. The result is natural-looking and long-lasting. Ronald B. Dinning, Santa Barbara 1805-A East Cabrillo Blvd.